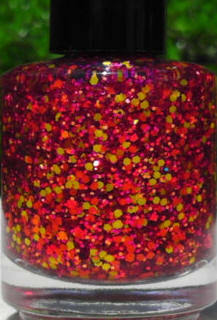 Today's post is mainly about 2 things - our love of Indie polish, and She Who Must Not Be Named. I'm gonna start with the important stuff first :) You may have noticed that a few weeks ago, this badge appeared in my sidebar. I don't know who created it, but a lot of the cool Indie Sellers I follow started sharing it, and I was and am proud to add it to my blog. 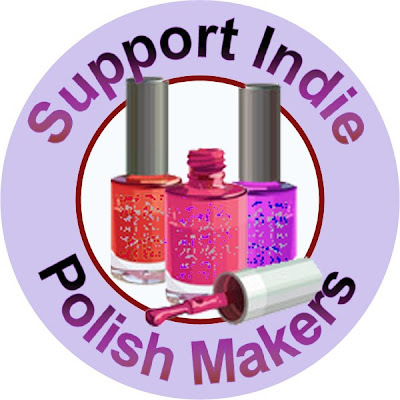 Since then, I've also proudly reviewed polishes for some of our best Indie sellers, and there are more on the way. These sorts of polishes are the only ones I will do "pure" swatches of from now on, and I am proud to support these women in their creativity, enthusiasm and passion. I wanted the badge to MEAN something though, so the blog is going to undergo a sort of Indie-vention, and get Indie'd up a little. Coming very soon is Indie Corner, a separate page (which you'll be able to see in that little header bar beneath The Crumpet) that will feature all sorts of Indie Feasts for the Eyes! So Indie Corner will feature Indie Sellers that I have used, with my opinions on them, links to how to find them and follow them, and links to any blog posts I've done about them, all surrounded by oodles of droolworthy photos! I hope you agree that that's something worth looking forward to. This week is also the week that my Lynnderella Rockafeller post topped 10,000 hits. 10,000! That's just c-razzzzy! I remember ending that post worried that the woman who started it all might have ruined it all for everyone else, but happily, the story is ending differently. So what's happened since my original post (which you can read here). So, let's look at eBay first. When I first posted my LR post, another blog, Polish Pixelle was also posting about the drama. Effectively, my post was sandwiched between 2 of hers. Someone commented on her 2nd post about the Limited Edition polishes Lynn had posted on eBay - you may remember that the bidding reached $800 or something - and at the time, Polish Pixelle took a lot of backlash for it. At the time, I just shook my head, and couldn't be doing with it, which is why I didn't post about it. If someone wanted to spend so much time researching and writing that Google doc, then so be it, but I had deliberately tried to avoid being overly judgemental in my post, and I didn't really want to change that. Anyway, this weekend, someone alerted me to the fact that AGAIN all the LE Lynnderella bids were finishing at EXACTLY the same amount - $700. Now, isn't that just WEIRD? Whatever you think of Lynnderella, what are the odds that every time she releases LE polishes, they will ALL be sold at the exact same price, and all the bid details will be kept "secret"? Personally, I can't be bothered to dig into it too much further, but it smells wrong. I've watched enough Gil Grissom to distrust coincidences, and this is just so fishy it practically comes with its own pond. I contacted Erica to ask for her thoughts - were they as similar as I thought, or were the pixels deceiving me? Erica agreed, and with a minor exception in the shape of one glitter, they are similar. Which then raises the following thought - for the woman who cursed those who were duping her, has she now started to dupe others ? Now, forgive me if I'm wrong, but I can probably count on 1 hand how many bloggers I have seen swatching Lynn's new Collection. Personally, I don't even like it, (and I LOVED her previous stuff) but that's irrelevant. Consider this - before the initial drama, Lynn would have sold her polishes to Llarowe, who would have sold them on to us, the polish lovers, many of whom are bloggers, and some of whom might have received the polishes in review packages to generate publicity and interest. I try not to be negative, but I do love that karma seems to have bitten an enormous chunk out of her backside - where's her sales now ? And this leads me to the end ... and back to the beginning. I have officially had it with Lynnderella now. You may have seen me sell several Lynns in my blog sale, well, the remainder are going on sale very soon too. I honestly can't bear the thought of wearing them. Why ? Because the woman they are associated with stands for every value I am personally against - she lies, she's egotistical, she bit off the hand that feeds, she betrayed the trust of her closest business partner ... and there's those fishy eBay sales - and every time I look at one of her polishes, my stomach curdles with distaste. So, they're for sale. Contrast this to the amazing Jenna of Lacquistry, who took it upon herself to replace 500 bottles of polish she sold A YEAR AGO because she has now noticed that SOME OF THEM bleed. What integrity! v what intregrity ? And that's why Indie Corner is being born. To champion people like Jenna (who I have never bought a single polish off by the way) and the dozens like her who are providing great polishes, great service and who LOVE all the polishaholics. It's going to take a while to build, so you'll see it evolving week by week, but wow, what a place it will be.